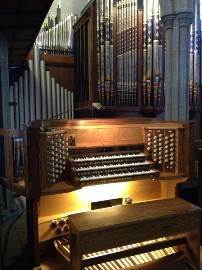 The Cornwall Organists' Association has just under 100 members that meet from February to November in churches in various parts of the county. It has one of the best attendances in the country, with generally about 45 present. The AGM is always in February and an annual luncheon or dinner is in March. Not all the members are organists by any means but the membership is made up of men and women who simply enjoy music. The meetings, in fact, reflect the membership and whilst there is usually an organ recital one of the sessions could be an orchestral concert, male voice choir or even a brass band! The COA has always been a pioneer in providing a good tea between the two sessions. Playing an organ can be a lonely job and our tea gives us all a chance for a chat in a friendly situation. The first session is normally at 3.00 and the last session after the tea at about 5 pm for about an hour. This gives members the chance to get home at a reasonable time. Barry Higgins will be pleased to have a chat about membership fees and standing orders!